As I had a cold and wasn't feeling so crash hot, I decided our Sunday Walk would be a quick- close-to-home affair, that didn't require too much effort - just enough to feel as though I'd done something. With that in mind, we set off thinking we'd go down to the Cascades (about 2ks away). Once we got there though,seduced by the bush and the sunshine, we thought, "well why not walk up the other side and see what's there".. I'm telling you now just to save yourselves the bother.. what's there is a lot of very steep hills and St Ives. So having walked to St Ives, there was no alternative but to walk back. The bush was lovely, lots of water in the creek and over the cascades, and lots of people on the track..the Oxfam walk must be soon, there were a lot of practisers out walking and a lot of bike riders -- how they manage to ride their bikes up those hills I don't know. We t r u d g e d back up Halloran and the steps to STM and Staggered home. .. 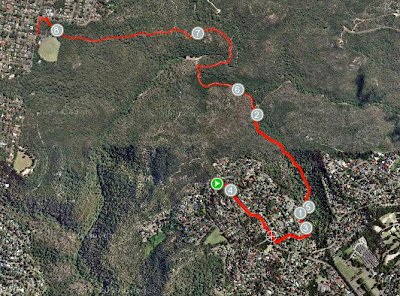 Final walk stats: 8.6 kms - up hill and down dale. Next stop - Davidson to Roseville Bridge -watch this space! !